Good Morning! I am happy to be joining my friends for the first (hopefully of many) A Paper Pumpkin Thing Blog Hop! This month we are taking the FABULOUS kit designed by Sara Douglas. While the cards in the kit are awesome, we will be showcasing alternative card designs and projects you can make by changing it up a bit. Looking at the kit the first thing that jumped out at me were the lined envelopes. I loved the print on the inside of them! I took my embossing tool and used it to heat the glue in the envelopes up so that it would be easier to pull apart and open. I used the inside of two separate envelopes to create the background. I used the Stitched Shapes Framelits to cut out the circle in the watercolor paper. Using the FREE GIFT watercolor pencils included in the set, I colored the background and then used the brush included to distributed the water and created this lightly colored Lemon Lime Twist background color for the sentiment. I love the fact that Sara used her own handwriting as part of the sentiments for this kit. To finalize my card I added a banner going from left to right and used the awesomely thick embellishments of the flower and leaves to complete the card. I love that everything you need to complete this alternative card was already included in the kit! My second creation was inspired by my upline. For my project, I again used the inside of the envelopes to create the striped background and then added two of our new in colors - Berry Burst and Lemon Lime Twist. Attached to the outside of the glass frame is a magnetic mat. This mat was cut from a package of vent covers that you can purchase at a home store. I used glue dots to adhere to the front of the glass. I added more of the embellishments to the corner of the frame and actually cut out the outside of the leaf stickers to add a little bit of contrast. This is an excellent idea to place the dies you are using for a project so that the various pieces will stay put and not get "lost" in your work space. I hope you have enjoyed my creations using this month's kit. I know that you will continue to be inspired by all the lovely creations the team has made. In just over a month, the new Stampin' Up catalog will be open for customer orders, if you do not have a demonstrator and would like a catalog, I would be happy to assist you. Don't miss your change to win this kit for FREE! BLOG HOP GIVEAWAY: To be entered into a drawing for a FREE "A Sara Thing" Paper Pumpkin Kit, you must leave a comment on EVERY blog. Drawing closes on Saturday, April 29th at 9 PM EST. The winner will be announced on Monday, May 1, 2017. I am so glad that you could join us for this special hop. Please continue with the rest of the gang by hitting the next button. You can also click each participants name below to go directly to their link. Enjoy your day and as always - Happy Stampin'! We are finally getting back to higher temperatures after a cool snap here in Georgia. This past weekend I was fortunate enough to attend the local Stampin' Up event in Savannah, Ga. If you have never been to Savannah, it is definitely something that you should put on your bucket list. We enjoyed walking the streets of Savannah as this was also the last weekend of the local music festival. I always get excited this time of year as the retiring list comes out and as an attending, I get to hold the new catalog in my hand and dream about it for the next several days. My roomies and I thoroughly enjoyed seeing all the upcoming products and demonstrations of the day, but we were also sad to see some of our favorites go. I made sure to place my order for retiring products as soon as I could on Monday. If you have items that you would like to order from the retiring list, I encourage you to order it as quickly as possible as it may sell out fast. Below is a link to the retiring list. One of the great things about attending Onstage is the awesome prize patrol giveaways. In Savannah we were fortunate enough to be awarded the Ribbon of Courage stamp set. Although we cannot show the stamp set itself, we can showcase projects we have made with the set. I am thrilled to share my card made with this set. Since the pink ribbon signifies Breast Cancer, I decided to use my Melon Mambo card stock for my card. I paired this color with Smoky Slate ink and paper as well as the silver cording. To give the card a little bit more bling, I embossed the "Courage" sentiment on the banner. I really love how this card turned out. This card would be perfect to give to a friend or family member that is currently battling cancer or is a survivor. If you do not currently have a demonstrator and would like a new catalog, please contact me and I would be happy to send you a catalog. I can't wait for the weekend so that I can create a variety of cards using this new set. Good Morning, everyone! Welcome to this month's OSAT's Blog Hop. The theme this month is "All you need is love". I was bet that most of you are like me when you read that and imaged the Beatles singing :). Not a bad thought for sure! This month, I decided to create a clean and simple card to go with the love theme. As we are getting closer to the spring, we will all need cards for those upcoming weddings. I used the new "Falling for You" stamp set from Stampin' Up on my featured card. I embossed the queen anne's lace stamp onto Mint Macaron card stock using VersaMark and white embossing powder. I also used this process to stamp my sentiment for the front. I used the new lace doilies from the new Stampin' Up Occasions catalog. and accented with white pearl basic jewels and organza ribbon I love the elegant look this card gives with the mint and white combination. What are your favorite wedding colors? If you have a small gift that you need to give, this adorable box is the perfect partner for this card. I found the tutorial on Pootles' YouTube. I think the embossed panels add an elegant feel to this uniquely designed box. If you would like to make this set, I have listed the products used at the bottom of this post. I am so glad that you decided to hop along with us today! Be sure to check out the other hoppers. Next up is Andrea! You can go to her blog by hitting the next button or visit any of our hopper's blogs by clicking their name below. I bid you peace and love - as always Happy Stampin'! Now is an excellent time to sign up to be a Stampin' Up demonstrator! 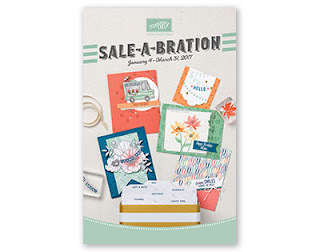 Whether you want to be a hobby demo for the discount or pursue it as a business, the Sale-A-Bration deal is awesome! For $99 you can choose $125 worth of new product and receive a free Paper Pumpkin kit. During SAB Stampin' Up is adding a bonus to the deal!! You can choose ANY 2 Stampin' Up Stamp sets for FREE.....yep, you read that right - FREE! This could be up to $108 in value depending on what two sets you choose. If your aren't quite ready to join Stampin' Up, you can still benefit from Sale-A-Bration. For every $50 spent from the annual or occasions catalog, you can pick a free item from the SAB flyer! Who doesn't love FREE? If you are interested in a catalog or would like to join my team, please feel free to contact me or visit my business page. Welcome to the Stampin Friends Blog Hop! This month’s theme is "Love". If you’re following along the hop, you’ve arrived from Melissa’s blog. Wasn't her creations great? Don’t forget to click the Next button at the bottom to continue on the hop at Maureen’s blog. I am glad to be kicking off 2017 with my fellow bloggers of the SF Blog Hop. Since this month's creative theme is love, I decided to use the Sending Love Suite from the new Stampin' Up Occasions catalog. For this card, I used the "Sending Love" 6 x 6 DSP. Aren't the little hearts just adorable? I also incorporated the silver metallic foil doilies from the annual catalog. The two sizes really fit right into my project designs for this month's hop. The silver from the doily and cording really give this card a little extra punch against the red, white and black color scheme. The sentiment is from the "Sealed with Love" stamp set. The more that I am using the photopolymer stamp sets, the more I am falling in love with them. I find myself ordering these sets whenever possible. I love the idea of looking straight thru the stamp while positioning my images to ensure that I am hitting the proper section when stamping. The miniature kisses for the background and stamped off image along side of the sentiment are really cute additions to the card. Although not used in my projects this month, the coordinating framelits with the arrows and miniature envelopes will definitely be used for future projects. Here is a close up shot of the sentiment and lip print. With the 27 different pieces contained in the stamp set, you could easily make your own DSP with several backgrounds. Have you every tried to make your own DSP? To continue on with the heart theme, I decided to create a gift box that coordinates with the Valentine card. I could see this box holding something sparkly to go along with the shimmer of the foil and metallic ribbon! I am so glad you were able to join my for my blog project. Please continue to follow along with the remaining hoppers. 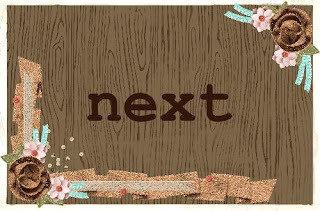 You can click on the "Next" button below to progress to the next participant or click the name below for a direct link. If you like our projects, please take time to comment. I enjoy creating projects and having others' creations shared with me. As a paper crafter, feedback is always appreciated. As we are getting closer to the end of the week, I hope you have a great day and enjoy the upcoming weekend.... and as always - Happy Stampin'! Kim Smith -----> You are here! Now is an excellent time to signn up to be a Stampin' Up demonstrator! Whether you want to be a hobby demo for the discount or pursue it as a business, the Sale-A-Bration deal is awesome! For $99 you can chose $125 worth of new product and receive a free Paper Pumpkin kit. During SAB Stampin' Up is adding a bonus to the deal!! You can choose ANY 2 Stampin' Up Stamp sets for FREE.....yep, you read that right - FREE! This could be up to $108 in value depending on what two sets you choose. If you aren't quite ready to join Stampin' Up, you can still benefit from Sale-A-Bration. For every $50 spent from the annual or occasions catalog, you can pick a free item from the SAB flyer! Who doesn't like FREE? Good morning everyone! 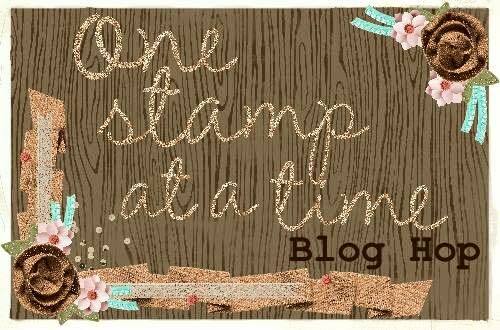 Welcome to the first 2017 One Stamp at a Time Blog Hop! This month's theme is No Rules New Year. I am glad to be joining my friends again this year to bring you creations that hopefully will inspire you. In November I attended my first Stampin' Up event and had a wonderful time! One of the make and takes that we created was the lovely card that you see below using product from the current catalog and items from the new Occasions catalog and Sale-A-Bration items that you can earn for FREE! I love using the new water color pencils along with the blender pens to color in the designer series paper. To compliment the card and to incorporate the current trend, I created a travel adult coloring book. This would be perfect to throw into your travel bag or purse for a long road trip. I used several different stamp sets to create the designs (Paisleys and Posies and Remarkable You). When I began to color the stamped images, I had to stop myself in order to take the picture for my blog! Very relaxing! I love the bright colors with this Sale-A-Bration DSP. You can't help but smile! I used the Lift me Up stamp set to accent the sentiment that was used from the Baloon Adventures stamp set. I hope you have enjoyed the creations presented this month and will continue to hop along with Jeanna! You can continue your journey by clicking the direct links below or the next button. Until next month...... as always - Happy Stampin'! Stampin' Friends - November Happy Holidays Hop! Welcome everyone! Today is blog hop day! This week I am hopping along with my buddies at the Stampin' Friends Blog Hop. If you are visiting all the blogs, you have just arrived from Robyn's page. I hope that you are enjoying all the creations and that mine will not disappoint! As the holiday's are fast approaching, now is the time to think about making those handmade greeting and gift card holders. As I recently attended a Stampin' Up event, I needed to create a gift card holder for a organized swap I was participating in. With my life running at the speed it is, of course I didn't begin my gift card holder until 8:00 the night before..... eek! I guess I work better under pressure. I finally dozed off about 2:00 in the morning, but I was able to create 20 of them for swapping. In coming up with my GC creation, I decided to use items from the Stampin' Up Holiday catalog. I loved the Cookie Cutter Christmas stamp set and the coordinating builder punch so much, I made a greeting card using the same stamp set and DSP accents to create the greeting card. For the card front and the base of the GC holder I used the crumb cake card stock. Basic black and real red were my accent color combination. There are so many beautiful designs on the Candy Can Lane designer series paper. I used my blender pen to color in the antlers of my Reindeer and of course he had to be Rudolph! My gingerbread man was a little spiffy with a bow tie and a touch of bling with the rhinestone accent. The real red stitched edge ribbon was used as a decorative piece as well as the pull tab as it wrapped around the gift card. Isn't the mini jingle bell adorable? The best part of this card holder is that I could cut 4 out of one sheet of card stock. I hope you have enjoyed my items that I have shared. Be sure to leave a comment for an opportunity to win multiple prizes. Hop along with the rest of the gang! Be sure to include #SFNovHop as part of your comments. For every blog you comment on with the hash tag, the more chances you have to win! It is almost like Christmas!!! Ha ha! We would like to wish everyone a happy holiday season. Enjoy your friends and family! As always, Happy Stampin'! Kim Smith - You are here!! Welcome to the November One Stamp at a Time Blog Hop! Can you believe that we are already in November.....bling and it will be 2017... eek! I am happy you decided to join in following along with this month's hop. The theme for this month is "Let it Snow". With this challenge I decided to go with a non-traditional color combination that we used in a recent demonstrator meeting with my up line - Diane Squires. The colors I used were Sweet Sugarplum, Smoky slate and of course Whisper White. The Flurry of Wishes was the stamp set used to create this cute snowflake card. I accented the sentiment by embossing in silver on vellum and attaching to the front of the smoky slate card stock. I added a little bling to the card by attaching rhinestones to the middle of the snowflakes. I continued with the silver accents with the addition of the ribbon to the side of the vellum pennant. As the holiday's are quickly approaching I decided to do a coordinating gift card holder. I love the way this holder has a sliding insert that holds the gift card. I am so glad that you decided to join us for this month's blog hop. I hope everyone has a safe and wonderful Thanksgiving! If you would like a new catalog annual catalog, holiday catalog or would like an upcoming Stampin' Up Occasions catalog, please let me know. I will be happy to send one your way. Check out the rest of the group's projects by clicking the next button below or directly on the name to be connected to the link. Next up on the hop is Kelly Acheson. Happy Stampin'! Kim Smith - You are here! I love all things crafty - anything that gets my creative juices flowing. Currently that means scrapbooking and card making. I find inspiration in all areas and enjoy looking at other's creations.